This Safavieh Courtyard area rug is sure to make a statement in any room of your modern home. Designed to decorate an indoor/outdoor space, this plush synthetic material rug is high quality. Comfort and quality come first in this machine-made rug. The floral plants pattern on this grey rug is very modern and stylish. Inspired by a mix of traditional natural earth tones with a splash of vibrant colour, the 6'7"x9'2" Tributary Arnold Brown indoor/outdoor mat brings an elegant transitional design to any living space. Using a blend of brown, green, grey, and beige yarns, the Tributary Arnold collection sports an organic and comforting look while providing a subtle splash of colour to compliment any room's decor. This premium rug is made with high quality polyproylene fibbers, resulting in a mould, mildew, and stain resistant flooring solution for your home. Densely woven, this mat provides unmatched durability and longevity while making it effortless to clean: simply spray with a hose or wipe with a damp cloth. Crafted and made in Egypt. Interior design is easy when you add this high quality Safavieh Courtyard area rug to your home. Modernly designed with you in mind, this plush synthetic indoor/outdoor rug will be a great addition to your home. Modern style and construction is combined in this machine-made rug. Keep things classy, yet high-quality with this geometric patterned red rug. 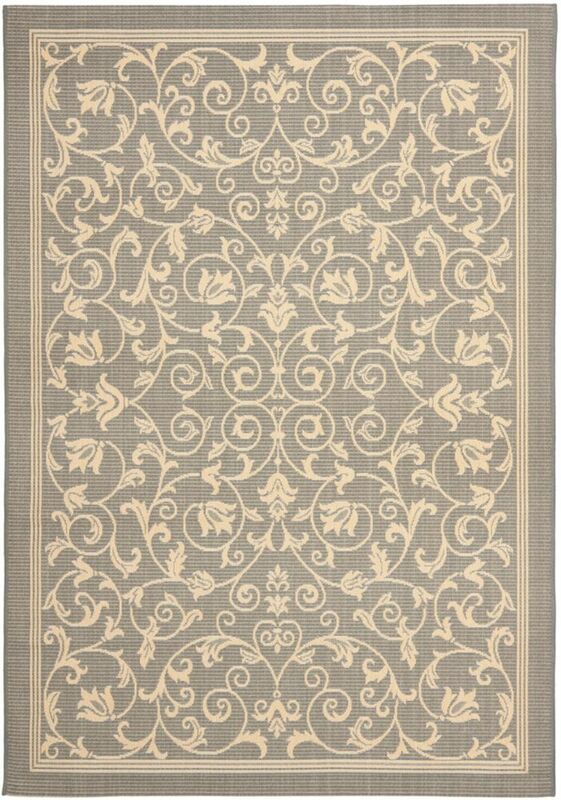 Courtyard Marc Grey / Natural 8 ft. x 11 ft. Indoor/Outdoor Area Rug This Safavieh Courtyard area rug is sure to make a statement in any room of your modern home. Designed to decorate an indoor/outdoor space, this plush synthetic material rug is high quality. Comfort and quality come first in this machine-made rug. The floral plants pattern on this grey rug is very modern and stylish.